irma loves life: Dinner is Saved (and Served)! Dinner is Saved (and Served)! There are days when I get swamped with errands and household chores (pressing my clothes takes an entire evening) and I can no longer cook a special dinner for Jed and myself. This restaurant only serves healthy meals. When I am feeling special, I eat in Piquant. Guaranteed delicious healthy food. While the regular menu prices are a bit pricey, their take-out toppings are cheap! The price ranges from Php 65 - Php 75. Instead of the usual white rice, Piquant uses brown rice. The first time I brought four orders home, Jed and I finished them all. Each take out meal turned out very tasty and filling. Of course, the #1 favorite take-out food is still PIZZA. 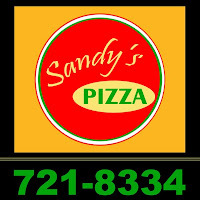 While we may have tried ordering from several pizza places, our recent favorite are pizzas from Sandy's Pizza. The owner, Sandy Arellano, happens to be my college roommate. I was very happy to learn of her new business venture. My first order was out of curiosity. Then her pizzas passed the taste buds of Jed & I, we found ourselves ordering again. We even ate the pizza side by side another pizza from an established pizza parlor, and Sandy's pizza won our hearts (and stomachs). Sandy's incorporated local ingredients which resulted in very interesting pizza flavors -- Garlic Tuyo in Oil (very very good! ), Garlic Chorizo, and White Pizza (with Kesong Puti). All yummy! La Senza Opens its Door to the Philippines Soon!